50 Cent says he's DONE being a Yankees fan -- and it's all because Derek Jeter allegedly tried to block him from an male underwear deal because he's too "urban." TMZ Sports broke the story ... the majority owner of the Frigo men's undie company sued Jeter -- claiming DJ didn't just back out of an agreement to promote the company ... but actively tried to stop them from using 50 as a brand ambassador. 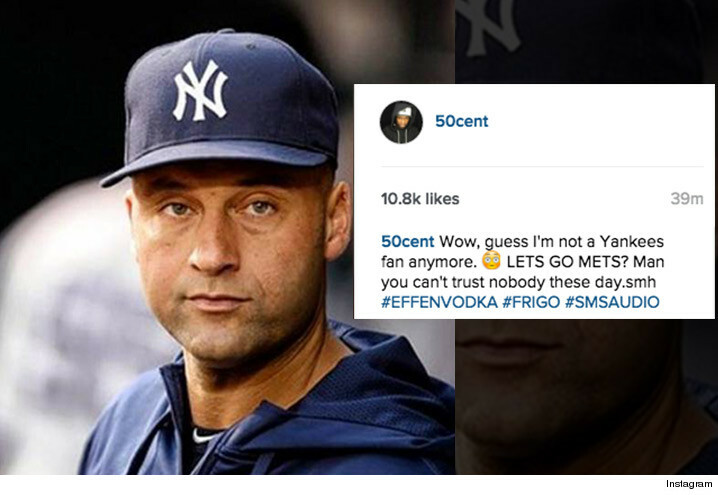 Now, 50 has responded on Instagram ... saying, "Wow, guess I'm not a Yankees fan anymore. LETS GO METS?" He added, "Man you can't trust nobody these day.smh." So far, the allegations against Jeter are just that -- ALLEGATIONS -- but seems 50 believes where there's smoke, there's fire.